With not much being in the fridge or cupboards for breakfast—nothing quick, anyway—I pulled out a little cup of yogurt. Innocent enough, right? 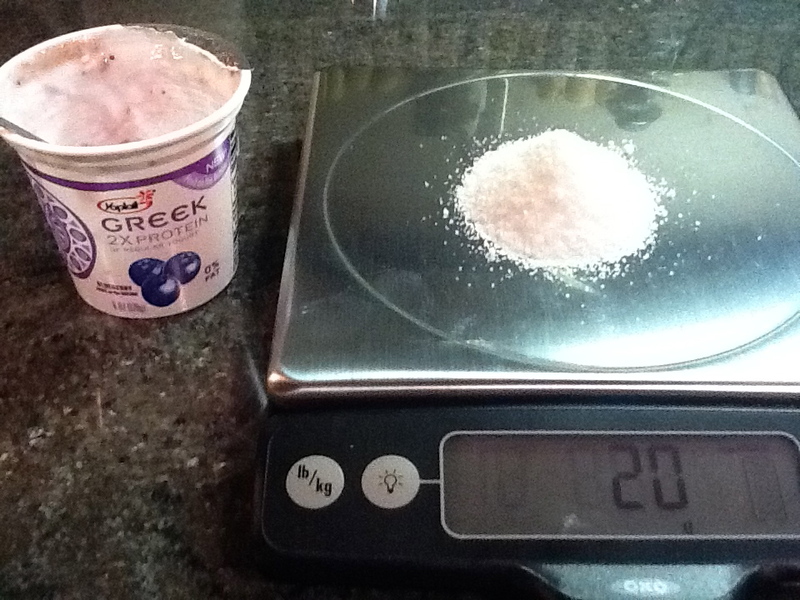 Plus, according to the Yoplait Greek yogurt packaging, it has twice as much protein and that regular ol’ yogurt. And I was hungry and in a hurry and it was blueberry flavored, so … I’ll just open it and eat it, although I’m basically off dairy for breakfast nowadays. And I gobbled. It. Up. Oh my goodness, that was good. Really good. I mean, so very, very good. What was in there? Ya know what was in there? Sugar. In some form, anyway. I normally don’t eat much sugar. I taught myself early on in my coffee-drinking adulthood to skip the sugar (and all those colored packets, too—really, don’t we eat enough artificial crap anyway?). Same with yogurt. Plain, unsweetened. That’s it. And, as an aside, same goes with the soymilk. Back to the sugary yogurt. I was curious about exactly how much sugar was in that little 6 oz. cup. Seeing that it said 20 g. on the label, I decided to pull out my digital scale to see exactly what 20 g. of sugar looks like. That’s not just 20 g. of sugar. That is a MOUND of sugar. Eat that with a spoon and you’d feel really guilty. Really. Guilty. Am I doing the math correctly? I don’t know. I hope I’m not. I do know that I’m not eating that again. Long live plain, unsweetened yogurt. Vive la Food Revolution. I much prefer the tartness of pain yogurt. I will add min own honey, but that is something that I can control. do the same with with sugar and you will thick twice about drinking a soda again! me, too! it’s like adding salt to something – add it to your own taste instead of relying on what they give you. You are currently reading Sugar in Yogurt Will Astound You at The Dainty Dot.